This is a lovely idea for a book. It’s not really intended for people like me who’ve been curled up with a book at bedtime since first being able to read, but rather for people who either never developed the habit, or as a consequence of the digital age, have lost the habit. Fold away your laptop and shut down your mobile phone says the blurb, and the introduction is a plea from the heart to do just that. Holden cites research that shows that screens diminish the hormone melatonin in our brains, making it harder to get to sleep at night. (As it happens, just recently Aunty ABC confirms this claim in ’10 hacks to help you sleep better’.) But Holden isn’t being a Luddite about our devices, he is making a compelling case for the sheer pleasure of reading at bedtime. from William Shakespeare to Haruki Murakami, Charles Dickens to Roald Dahl, Rabindranath Tagore to Nora Ephron, Vladimir Nabokov to Neil Gaiman. Apart from the nod to Nora Ephron, what the blurb doesn’t note is the wealth of stories contributed by women: Margaret Atwood, Nicola Barker, Angela Carter, Dorthe Nors, the British poets Wendy Cope and Elizabeth Jennings, Lydia Davis, the US poets Sylvia Plath, Jane Kenyon, Sharon Olds, Adrienne Rich, Louise Gluck and Myesha Jenkins, Shirley Jackson, Katherine Mansfield, Jean Rhys, Muriel Spark, Virginia Woolf and Elizabeth Taylor. Translations include stories by Jorge Luis Borges, Anton Chekhov, The Brothers Grimm, Tove Jansson, Stéphane Mallarme, Guy de Maupassant, Czelsaw Milosz, Haruki Murakami, Dorthe Nors, Isaac Bashevis Singer, and Antoine de Saint-Exupéry. This makes for a huge variety, ranging from the long ago to contemporary times. I haven’t read them all: this is a book to dip into. I decided to dip into Rabindranath Tagore’s ‘A Single Night’ (1892) (for the rather lame reason that he won the Nobel Prize in 1913) and was transported to a world so different from mine I was breathless. It’s a story of an ambitious young man who leaves his village with dreams of success in the (then Colonial) public service or becoming a Garibaldi, and in so doing leaves behind the young woman to whom he’d been betrothed since childhood. But he ends up back in his village as a humble schoolteacher, living right next door to Surabala but unable ever to see her because of purdah. The story was translated by William Radice. For the same reason, I checked out Isaac Bashevis Singer, who won the Nobel in 1978. I was a bit puzzled to see that there was no translator acknowledged for his story ‘The reencounter’ (1979) because Wikipedia says that he was a leading figure in the Yiddish literary movement, writing and publishing only in Yiddish. I was a bit puzzled by the story too: a rather alarming one for bedtime IMO because Max Greitzer thinks he went to sleep last night a healthy man but in fact is dead and having an astral experience with a love interest from long ago! But my last choice of Nobel winner, Czeslaw Milosz (1980) was more pleasing: I haven’t taken the liberty of quoting Holden’s excerpts because the whole poem Ars Poetica, (1968) is available on line. Holden credits the translation to Milosz and Lillian Valee. It’s a lovely poem, perfect for bedtime reflections on the importance of other people in our lives. My only complaint about this lovely book is that it’s hardback. Everyone knows that hardback books are no good for reading in bed; it needs to be reissued in paperback! Review copy courtesy of Simon & Schuster. 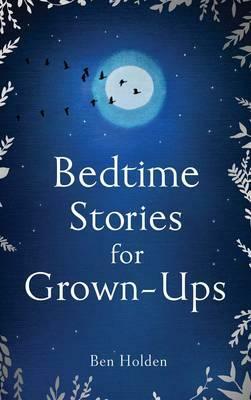 Available from Fishpond: Bedtime Stories for Grown-Ups and good bookshops everywhere. Thanks for reminding me of Tagore. Been on my reading list so maybe this summer will indulge. I don’t think I’ve ever, ever come across his work in a bookshop. Just last week I scoured the classics shelf in a bookshop new to me (and brought home some treasures) but no, nothing by Tagore. He doesn’t get a mention in 1001 Books either. I would never have heard of him if he hadn’t been recommended to me by Vishy who has a wonderful list of recommended reads from India at his blog (vishytheknight.wordpress.com). Thank you for reminding me to put my tablet away at night. It really has become another appendage. I would get through more books too. Liked your comment about Aboriginal stories. Great post.